It seems like every year I run into some kind of trouble with my HIMSS registration. I learned quickly that you have to make your hotel reservations early. When I went to make them this week, I quickly ran into an issue. It seemed like every hotel I looked at was sold out for Wednesday on. Mind you, the conference runs Sunday through Thursday. No matter how far away from the convention center I looked, the blocks looked the same (except for a few of the pricier hotels). I looked on the hotel’s direct registration site as well, but it didn’t even appear as available on my desired dates. I went ahead and booked to depart Wednesday, since I didn’t feel like switching hotels. I’m not sure what prompted me to do it, but today I went on the hotel website and tried to book for just Wednesday. Guess what? Rooms available, and lots of them! Apparently the HIMSS block only extends through Tuesday night, which seems pretty ridiculous for a conference that runs through Thursday. Needless to say, I have two reservations at the same hotel for adjacent dates. From experience, this will likely turn out fine, but it’s just one more needless aggravation. Especially for those of us paying out of pocket for the less-than-cheap experience, it’s doubly annoying. Hot on the heels of my recent Curbside Consult addressing the gap for professional development for healthcare workers thrust into IT roles, ONC will host an informational webinar covering the Workforce Training Program available to healthcare IT professionals. It specifically says it will address new training programs available “to help health care workers and others stay current in the changing healthcare environment.” Training includes both online and in-person sessions and have been organized to address IT skills needed by various members of the care team. The webinar is on August 24 and registration is open. I’d love to hear from anyone who has firsthand knowledge of the Workforce Training Program. I had mentioned back in the spring that I was waiting for Ringly to release a silver version of its bracelet. They put one up for pre-order a couple of months ago, so I took the plunge. I knew they wouldn’t be available until fall, and with everything that has been going on for me recently, I somewhat forgot about it. I was happy today to see a sneak peek of their packaging, so at least they’re getting closer to shipment. I’ll definitely do a product review once I have it in hand (or on the hand, as the case may be). I’m always horrified when I see people in surgical shoe covers outside the hospital because you can’t wear them back into the operating room and who knows what has been tracked out of the OR. I’d have liked to see something specific to that, although I bet they thought they implied shoe covers when they addressed scrubs. There was a nice section on the wearing of the surgical skullcap as symbolic of the profession. It didn’t go into a debate on the use of the skullcap vs. the bouffant cap, which was a detailed topic of conversation during my surgical rotations as a student. 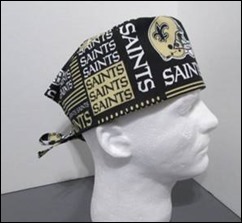 The last surgeon I interacted with (as a family member agonizing in the waiting room) was wearing a Saints cap, which was appropriate given his recent fellowship training at Ochsner. I wasn’t that impressed, however, by his white rubber rain boots, into which he had tucked his scrub pants. It was a unique look that got more than a few funny looks by waiting loved ones. I also received some updates from the Aprima user conference, which was held last week in Dallas. Apparently they were sharing hotel space with a Mary Kay cosmetics conference, where some attendees sported beauty queen sashes and tiaras. My correspondent said it reminded her of HIStalkapalooza. Educational highlights included Chronic Care Management tools, Patient-Centered Medical Home pre-validation, and MACRA readiness. There was also a Casino Night social event as well as the opportunity to help make blankets for the Children’s Medical Center in Dallas. Sounds like a good time, even with the Texas heat. The annual user group season is upon us. The Allscripts Client Experience is going on this week in Las Vegas including a party on the Mandalay Bay beach. Next, Epic will host their “An Adventure in Wonderland” event September 19-22. Anyone want to lay bets on Judy being costumed as Alice? NextGen is holding their annual event November 6-9 in Las Vegas, with attendees hopefully remembering to absentee vote since their client event is being held on election night. Cerner rounds out the fall with their meeting November 14-17. What makes a user conference worthwhile for you to attend? What’s the best social event you’ve experienced? Email me.